Gary and Julie Hounsell are proprietors of Toolangi Vineyards and happen to be two of the most generous people in the wine community. Emanai is the latest addition to their range and, coincidentally, it was made off-site by my very first boss in winemaking, Franco D’Anna of Hoddles Creek Estate. This young gun winemaker got to have a bit of fun playing with Emanai’s interesting blend of chardonnay and viognier. Franco used the low-cropped fruit from the Dixon’s Creek vineyard, which he then co-fermented and matured in old French oak for three months. The result is not an abundantly fruit-driven wine but one that ticks all the boxes for texture and interest. The nose offers aromas of smoke, citrus, hay and papaya with a lingering scent of candle wax. The palate has the classic oily texture of viognier, yet with an atypical flavour, which leans towards the green fruit spectrum. Overall, this is a fresh style of wine with a delicious chalky mouthfeel, quite tart acidity and a mineral finish. With its colourful pixilated artwork by Julia Ritson adorning the label, it is hard to miss Emanai on a wine retailer’s shelf. Kirrihill is located in the Clare Valley – a treasured area producing world-class Riesling. The Slate Creek vineyard lies within the sub-region of Watervale, locally referred to as part of the “Golden Mile” of Riesling because of its consistency in quality. It may seem off-topic to now mention Cate Blanchett, one of our homegrown golden talents in the film industry. Mind you, I would not be the only person slightly infatuated with her flair. It’s just that the unquestionable attraction of Ms Blanchett and her consistently good performances had me drawing strong parallels to the Kirrihill Riesling I was sipping in my glass. The Riesling pours ultra youthful and pale into the glass à la Ms Blanchett’s moonlight-hued skin. The aromatics and flavours lean towards the fine and delicate end of the scale but with a quirky touch, just like her slender build and sense of style. I found lemon pith, pebbles, and a fun touch of peppery rocket on the nose with crunchy, pink grapefruit acidity on the palate. Refreshment is the import for this wine and it sits dry on the sweetness scale. 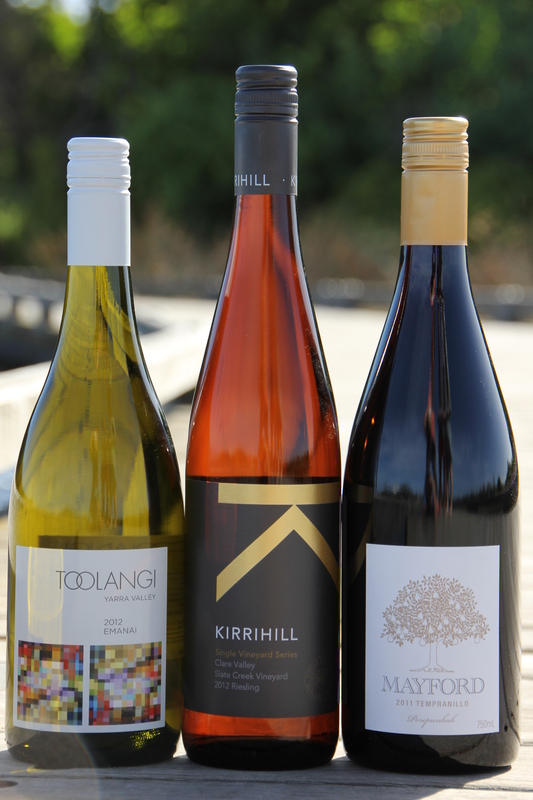 The Kirrihill Riesling is original and a breath of fresh air. Watching the credits roll after one of Ms Blanchett’s big screen hits aroused the same kind of feelings as I emptied my final glass of Kirrihill…I was left yearning for more. I discovered Mayford Wines by tasting their 2010 vintage at the Australian Alternatives Varietal Wine Show in Mildura last year. I got in touch with the winemaker Eleana straight away to get my hands on a bottle. They had moved onto the 2011 vintage, which fortunately is just as moreish as the other. There are a number of wine regions around Australia growing delicious styles of Tempranillo, such as McLaren Vale, Canberra District and at Mayford in the Alpine Valleys. Over time Eleana has become enamoured with Tempranillo in this region. She treats the grapes with a weeklong soak at cold temperatures, then warms the juice and lets wild yeast do the fermentation in open vats. Some of the wine spends an amazing eight weeks on skins followed by a year in old oak. The result is a Tempranillo that pours with the most youthful, vibrant magenta colour. The perfume conjures up a mixture of ingredients including blueberries, blackberries, herbs, vanilla and peppered cola. The palate opens with sour cherries and stewed rhubarb, wakes you up with its tart acidity and finishes you off with fine but slightly furry tannins. Try a bottle with your next round of barbecued red meat like porterhouse or lamb.